Park before the bridge near to the farm of Shillmoor, in Upper Coquetdale (NT884078). Cross the bridge and turn right down the road past two houses on your left. Before reaching Shillmoor, take the track to your left into the valley of the Usway Burn. Ignore the `Private Road` sign. Within 100 metres follow the track on the left, which climbs away from the main track, alongside a stone wall. Continues to climb close to the wall and then a fence. Continue through the gate, just above the small crags on your right, and after further climbing along a grassy track you will reach the top of Inner Hill. Continue along the broad ridge before crossing the fence, via a gate at the col. 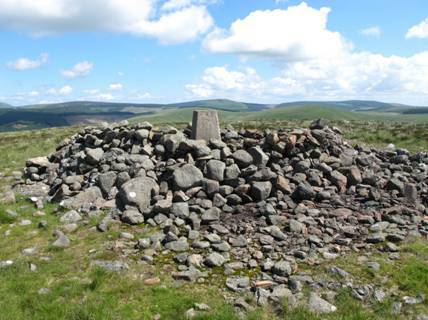 Climb on either of the two tracks to the trig point of Shillhope Law. This stands just west of the fence.